Leader of a defense team regarding hundreds of plaintiffs, as part of a nationwide mass tort litigation against a pharmaceutical company. Trial counsel for a subsidiary of a supermajor oil company in a dispute with the State of California concerning breach of contract and environmental claims exceeding $100 million. The case settled on favorable terms the third day of a jury trial. Represented various clients against Lanham Act infringement and consumer protection act claims. Trial counsel defending engineering company in a $170 million power plant case (jury denied fraud claim, and awarded a fraction of the claimed damages). Trial counsel in County v. Brown Group Retail, Inc. (District of Colorado) (favorable toxic tort trial). Trial counsel for a NYSE company against false advertising, breach of contract, and conspiracy claims (full defense jury verdict). Trial team leader in a five-week trial on behalf of schools and students against the State of Colorado in a historic public education finance case. Mr. Kawanabe is the DGS Pro Bono Partner and was on the DGS Executive Committee. He teaches at the National Institute for Trial Advocacy and dedicates significant time to volunteer work, including board service for Colorado Legal Services and Colorado Lawyers Committee. Mr. Kawanabe is a fourth-generation Coloradan who engages in community service. He currently serves as board chair for the Boettcher Foundation, and is the former board chair of The Denver Foundation, one of the nation’s largest community foundations which annually grants tens of millions of dollars to nonprofit organizations. He also served on the boards of the Sakura Foundation, Colorado Nonprofit Development Center, Community Resource Center, Foundation for Sustainable Urban Communities, University of Denver Institute for Philanthropy and Social Enterprise, and Asian Americans Advancing Justice. Mr. Kawanabe served as a law clerk for then Chief Justice Mary J. Mullarkey of the Colorado Supreme Court. 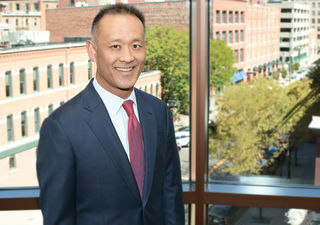 He is a member of the American Bar Association (ABF fellow), Colorado Bar Association (board of governors and Bar Fellow), Denver Bar Association (board of trustees and Executive Committee), National Asian Pacific American Bar Association (first-ever general counsel), Asian Pacific American Bar Association of Colorado (past president and foundation president), and Minoru Yasui Inn of Court.